The Titan Zeus is a 370in, £1 million TV | What Hi-Fi? At 370 inches, the Titan Zeus is the same size as a football goal. It's designed for indoor use but can be used outside in sunlight. Each Zeus costs £1 million. 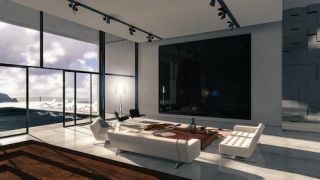 British screen manufacturer Titan has unveiled the Zeus TV, one of the largest and most expensive TVs available to buy. It measures a hefty 370 inches – almost the size of a football goal – and costs a cool £1million. For such a large sum, you'd expect the Zeus to support 4K technology, and thankfully, Titan has delivered. The Zeus has 65 billion colours and weighs in at nearly a tonne. Titan says only four Zeus screens will be made, with two having already been pre-sold: one to a British media millionaire, and the other to be built on top of a hotel in Cannes. For an extra fee, Titan will install your TV and deliver it in a custom built Hummer. Titan CEO, Anthony Ganjou, said: "We have assembled the best screen technologists in the country to hand build a British-made screen which would not only be the biggest but the most the extraordinary ever conceived." "Following the interest in the launch of our ultra high-end 173 inch domestic screens, we decided to create something iconic and the team spent six months building the million pound screen."